Fr. 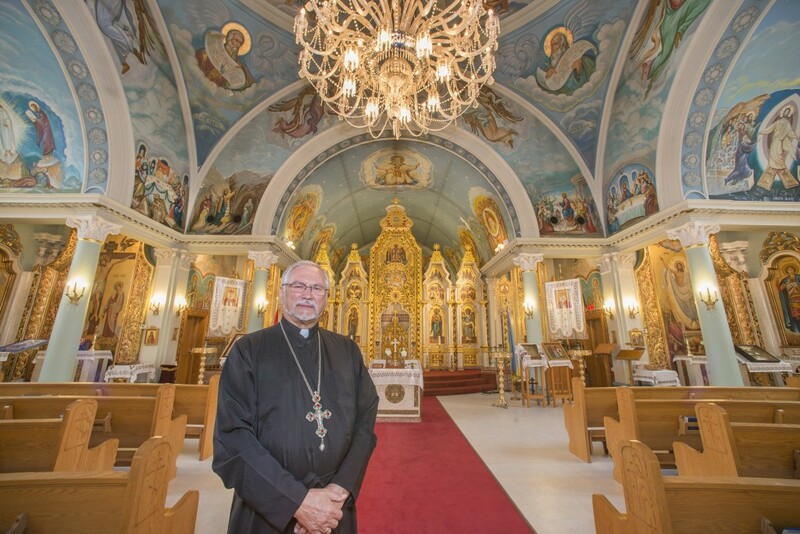 William Makarenko, parish priest at St. Vladimir Ukrainian Orthodox Church, 885 Barton St. E.
St. Vladimir can’t change its demographics — the good news is that it might not have to. On Barton Street, just west of Gage, the small Ukrainian Orthodox church has a plan to stay afloat, even if its membership continues to sink: land. “We have a body and a head,” explains parish priest Rev. William Makarenko. Over the past 30 years, the congregation at St. Vlad’s has dropped from 900 to 320. Over the next 10, it’ll dip further — in Makarenko’s estimate, by another third. And while the church isn’t yet in any trouble, by then it could be. The younger generation of congregants is “up to their necks in debt,” and they’re not giving, or even attending church, as their parents and grandparents did before them. “The mindset is different, the way they view themselves, their ethnic identity, is different,” Makarenko says. So he’s prepared to cash in. More than 30 years ago, St. Vlad’s invested in 14 acres of prime waterfront property in Grimsby. The church’s plan, he says, is to either co-develop or sell it and live off that money indefinitely.